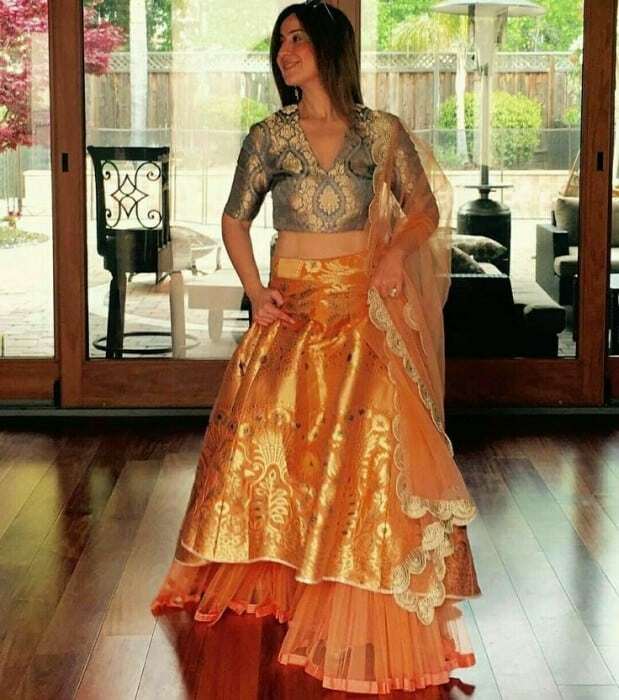 Recently, Banarasi lehenga has become the most popular outfit of any celebrity wedding. 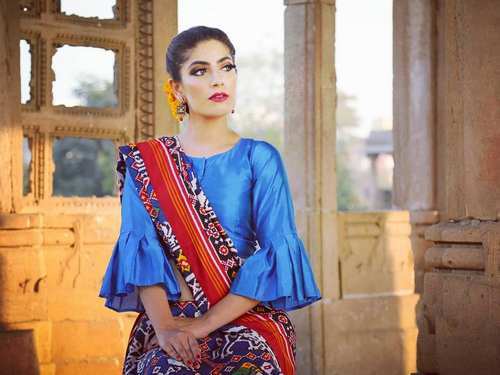 This has created an immense wave for Banarasi lehenga across the nation. But this is not the only reason for the popularity of this fabric. These banarsi lehengas with intricate designs and traditional motifs embroidered in rich silk fabric, makes it a classy choice for any celebration. 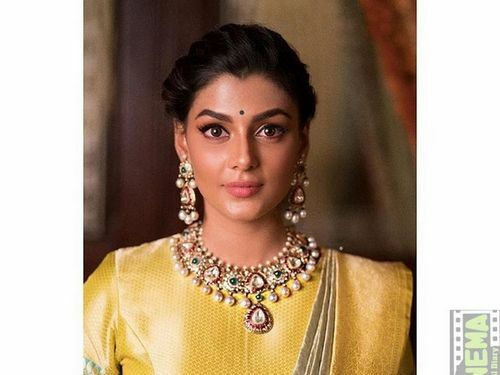 Indian brides who are planning to have a regal look on their D-day are picking Banarasi bridal lehenga to get that historic look. So ladies if you want to stand out in your D-day then do have a look on these beautiful Banarasi Bridal lehenga. We have compiled a list of stunning Banarasi bridal lehenga in rare color combinations. 1. Ivory color lehenga: If you are looking for some pretty color combinations then this one is surely going to inspire you. The ivory color flaired lehnga paired with fresh orange and mystical red colored dupatta. 2. 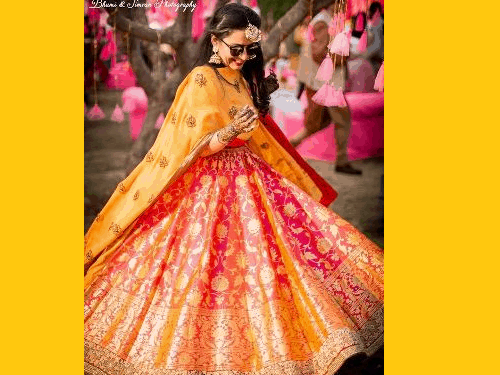 Mustard lehenga with maroon blouse: One of the most popular and age old color combination of mustard yellow with maroon is every eye’s delight. This color combination works magical for Indian skin tone. 3. Subtle pink: Looking for some more fusion, then try this subtle pink monochrome lehenga. The hint of mint color has added depth to this beautiful creation. 4. 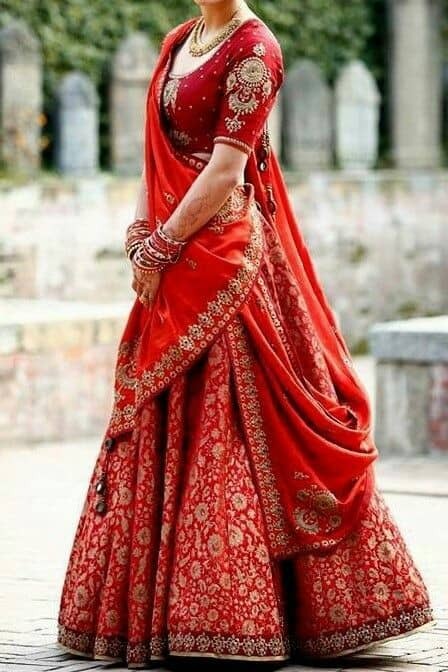 Mighty red: Want to feel like royal queen on your D-day then try this majestic red lehnga. The voluminous banarsi bridal lehenga has beautiful floral motifs made of intricate golden zari work. The plain dupatta with fine border draped across the body in traditional style ensures that it scores high in style and elegance. 5. Fiercy magenta with royal ivory: After red, magenta scores highest in bride’s color palette. The bold hue of magenta is the perfect pick for the wedding day. The royal ivory dupatta adds the much needed glow on the face of bride. 6. Fluffy affair: Adding cancan can volume up your lehenga but if you want to roll the dice in your favour then do try this style. The drawback of cancan is that they are stiff and needs extra care to ensure that they are not visible. In this case you can try layered lehnga which volumes up your lehenga in style. To make things comfortable look for a lighter fabric for the bottom layers. 7. Queenly red with flaming orange: You can add some brightness to your traditional red lehenga by draping it with flaming orange. The vibrant colors and the golden zari work will add to your bridal glow. 8. Warmy red: For ladies with wheatish skin avoid coral red and look for a warmer hue of red like this one. 9. Monotone pink: You can pick a single color and shine confidently in that. The intricate embroideries in the banarsi lehenga makes it a splendid one. 10. 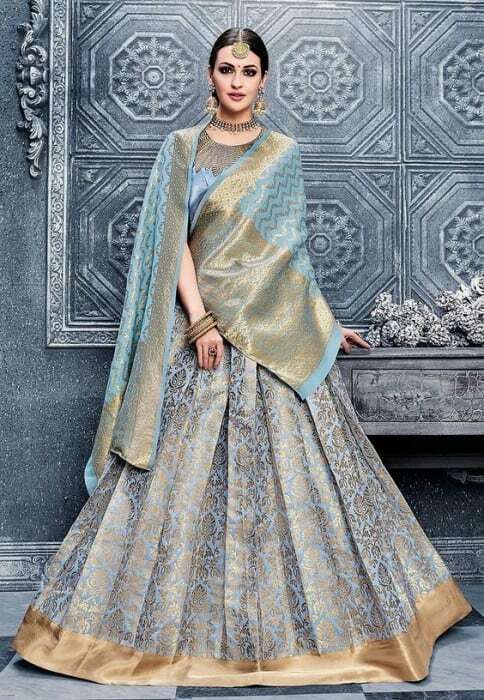 Banarsi designer lehenga: This unique designer lehenga with subtle colors is a classy choice. Adding colorful layers to this monochrome off white lehnga makes it a unique one. 11. Flaming orange with dusty blue: This rare color combination looks so refreshing and perfectly balances the whole look. The cancan net at the bottom of the lehenga gives it a structured look. 12. Red and pinks: The splendid banarsi lehenga with beautiful blend of two majestic colors. The teal blue color blouse beautifully complement these vibrant colors. 13. 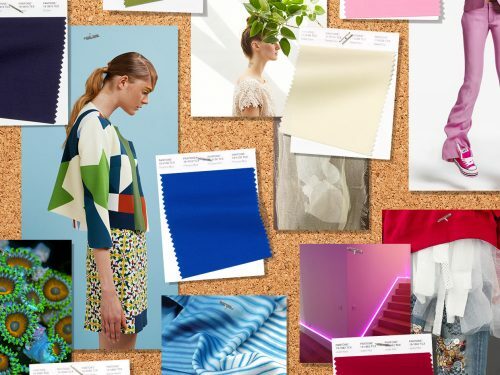 Distinct bride: Ditch the traditional red and go for this rarest combination of green and blue. To get a distinct look go for double dupattas in dark and light shades. 14. Soft pink: For day weddings and functions, the pastel colors are the best one. 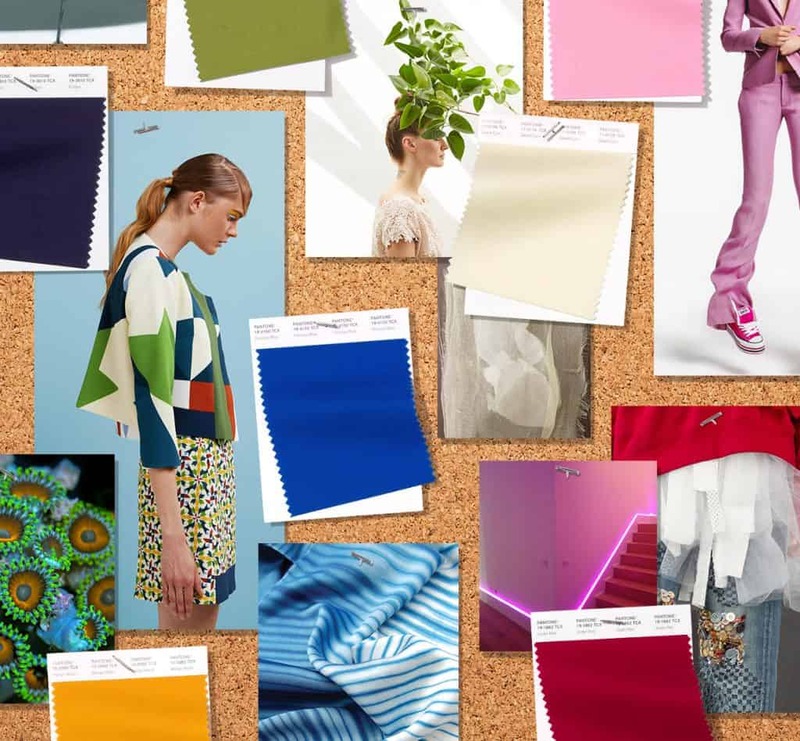 You can look for the monotone outfit or for a mix of few different color pastel shades. 15. Sombre blue: Beside soft pink the other pastel color that is most loved by the bride is the steel blue. It effortlessly matches with the day light and is surely a magical shade. 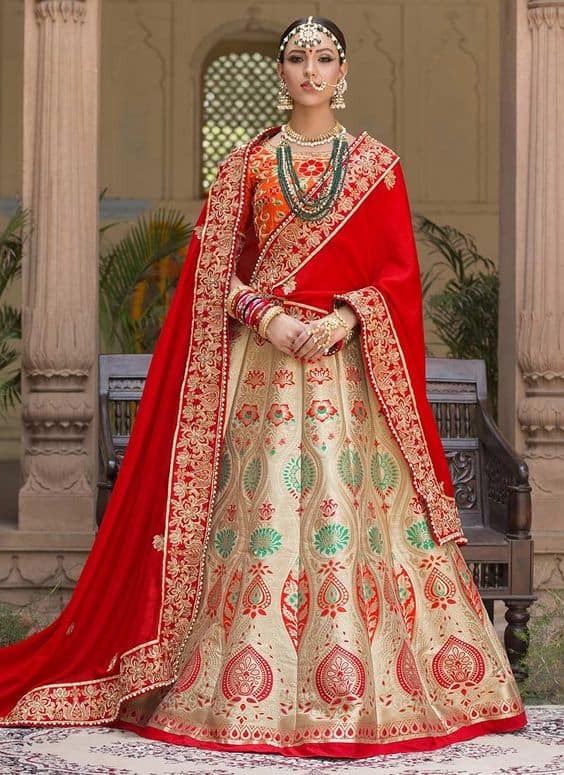 There are plenty of online stores from where you can pick the perfect Banarsi bridal lehenga for your D-day. 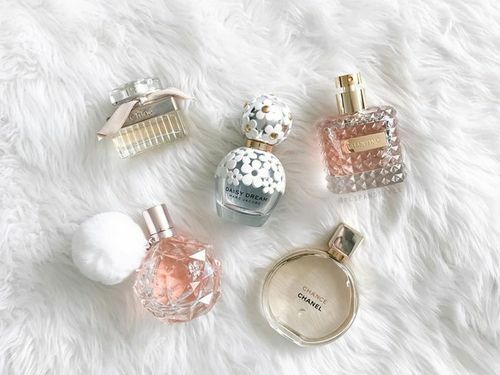 Some of the most popular online stores known for their quality and great variety are listed below.